The Sylvan bestows enchantment on your landscape - while it provides you with a shady retreat on a lazy summer day or a pest-free evening of entertaining family and friends. 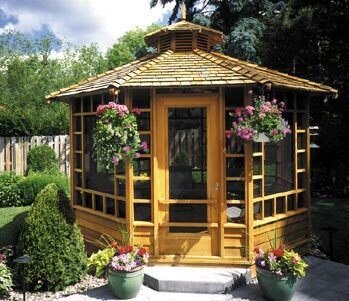 Depending on the setting, as well as the features you choose for your Sylvan, this gazebo can be reminiscent of craftsman design, or take on a more Asian-inspired feel. The louvered cupola option, featured on this 13 foot Sylvan, is an appealing detail and is just one of the many ways a homeowner can customize our gazebos to make the one they choose uniquely their own.